Learning is personal. For me, learning is on demand, relevant and about making connections. This school year, one of my major goals was to design opportunities for my students to authentically learn more about what they are passionate about. The result is one of my proudest accomplishments as a teacher. My students in AP Economics have the opportunity- and obligation- to submit assignments of their choosing on a topic of individual interest. This component of our course is labeled Challenge by Choice. This work gives students the flexibility to choose a focus and application of course concepts. They can choose the format of the work they do (read a newspaper article, write a paper, conduct an interview, film a TV segment, conduct a debate, etc.) and each piece earns points relative to the size of the assignment (points are based on a combination of time, effort, insight, etc.). Students must earn 200 points each semester. The results have been astonishing and I will be sharing some of their work as we design a sort of online journal and digital poster session. A few highlights include an analysis of the elasticity of school spirit shirts, an investigation into gender inequality within the economics profession, a thorough analysis of the Philadelphia 76ers tanking and “The Process” strategy, interviews with family members who utilize economics, quantifying the profit lost by Ray Consella in “Field of Dreams,”and relevant topics in the headlines such as BitCoin and Net Neutrality. More importantly, student work sparked in class conversations and dialogue. One student had read the book “Thinking Fast and Slow,” which is one of my favorite books and I was thrilled to talk with a student who was not always the first to speak up in class; this helped him find his voice. Students asked questions about Amazon’s potential move and the relevance of our work on the long term supply of competitive firms. Beyond the work students put in outside of class, the ability to connect core curricular content to their interests and current events deepened their understanding- the ultimate learning outcome. A few nuts and bolts: This has not been an easy ride. Our Learning Management system Canvas has enabled me to receive submissions, but because these are not traditional assignments (i.e. the point values vary) the grading has been complicated. Some students procrastinated and were on the verge of failing this component of the course. Most of the submissions were written work, which took time to grade and students did not always know how many points they had earned in real-time. I updated students every two or three weeks, but at the end of the semester students wanted to know each day where they stood. I don’t have answers yet as to how to streamline the submission and motivate students’ willingness to move beyond written work, but I hope someone who reads this might offer perspective. Implementing strategies: If I want students to take this seriously, I knew that I needed to properly incentivize this work. I showed students the image posted above and told them they would be assessed for 40% of their final grade on their challenges (50% is AP style tests and 10% are small assignments). I also gave students two or three days per month to work on their challenges and provided nudges to students in the form of a podcast to listen to or article to read, so students did not feel stuck and had some directive if they needed it. I am lucky. I teach AP Economics and am able to teach both the AP Microeconomics and Macroeconomics curriculum. I am lucky because there is overlap between these two typically one-semester courses and instead of complaining that I don’t have enough time to prepare my students for their AP Exams, I find myself with a bit of extra time to allow students to deepen their understanding. Ultimately, I hope my students build a foundation of economic understanding that they can apply to their lives. Challenge By Choice is the means to reach that end. This entry was posted in Education, Teaching and tagged AP Economics, apply, challenge by choice, economics, education, learning, principles of economics, student choice. These are the resources that will be presented on Saturday at 11:00 (room 108 in BCEC). This entry was posted in Economics, Education, Mathematics and tagged economics, math, math applications, Mathematics, NCTM, teaching. As a class project, a student wanted to calculate the velocity of a marker being thrown into the trash. He calculated the time it took the marker to hit the trash after he released the marker and the distance to the trash. This is the horizontal average velocity, so I asked him to go further. 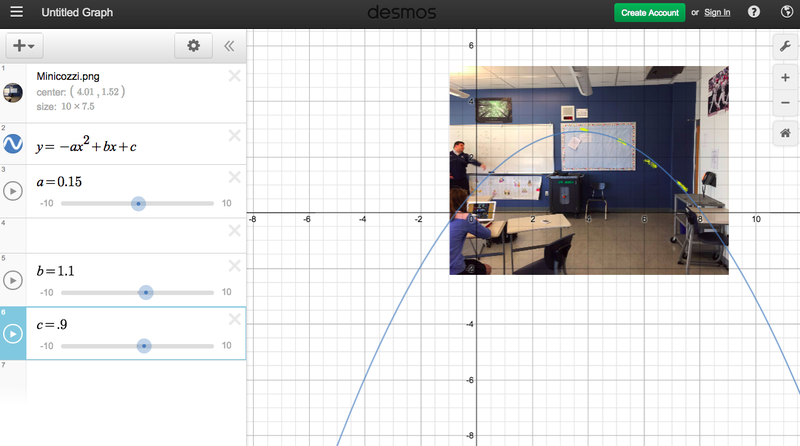 The image below is a projectile motion still and a quick desmos graph of a parabola of best fit. Now he has an equation for height… his task is to determine the vertical velocity. Below is a link to a video of how I created this image. This entry was posted in Education, Teaching and tagged calculus, desmos, parabola, projectile motion, velocity. Five week into my hybrid AP Microeconomics course, we had our first major test. Having only met in person four times, I was anxious to see the results. The test was marginally more difficult than the same one given to my “face-to-face” AP Microeconomics course this fall. The results were better than my students from the fall! My first major realization is that the students are very much actively engaged with the material; there are readings, workbook activities, videos, and online quizzes. In a traditional class, students may have been able to not thoroughly complete their reading or problems, then coast through a 40-minute class. During our in-person sessions, the students have more thoughtful questions because they have confronted the material on their own; they make connections, ask insightful questions, and anticipate concepts. their required engagement with the concepts and really wrestling with ideas that can be difficult and deepening their understanding by explaining examples and different ways of thinking about a problem or idea. So the quantifiable results are at minimum on par (probably better, but small sample size), but the student engagement with Microeconomics is clearly through the roof. These students are becoming active learners; a skill as useful as the economics they are learning. This entry was posted in Economics, Education and tagged AP microeconomics, canvas, hybrid, online learning. I am teaching a hybrid AP Microeconomics course this spring. This is the first of three posts describing my experience teaching this course. The first is the basics about the course. Attached is a FAQ that I sent to students before the class began. This is a one-semester course. It is a hybrid course where students meet once every six school days and complete online readings, activities, and assessments. The goal was to add the opportunity for students to fit the course into their schedule and to add the flexibility to students’ workload. Students are expected to complete about an hour’s worth of work each day (equivalent of 40 minute class plus 20 minute homework). Students use the Learning Management System Canvas. Students read from Mankiw’s Principles of Economics textbook. Students complete workbook activities from Stone’s AP Microeconomics Resource Manual. The schedule was challenging to coordinate everyone’s availability, given that we did not have a dedicated meeting time. Students take in-person quizzes and tests by scheduling a convenient time. This entry was posted in Economics, Education and tagged ap, ap micro, economics, education, hybrid, online learning, teaching online. Yesterday during a tangent in my Algebra 2 class I realized how little understanding my students had about the voting process as well as how predictions are made and how, when, and why networks announce winners without all of the votes counted. Today, I ran an activity that pitted Heads vs. Tails. Each student received a penny and flipped the coin to determine their vote: Heads or Tails. The class consisted of 19 students. In our first election, we strictly counted votes- a popular election. Tails beat heads 10-9. In our second election (everyone re-flipped their coin), the girls announced first: tails 6 and heads 5. I asked our students, what do we EXPECT to happen with the remaining 8 votes? Assuming fair coins, we expect 4 for heads and 4 for tails. So if we had to bet, would we bet that heads would win or tails? Since tails already had a 1 vote lead, tails was most likely to win. In fact, the scenario most likely to result in a win for heads was 5 heads and 3 tails. This was not a probability class, but with some basic concepts we could have given percentages to each outcome. In our third election, I told the class that the front row (5 students) always voted heads and were going to vote for heads again. With 14 students left to flip, I said that I had enough information to call the election and was sure heads would win. Again, with the likelihood around 75% that heads would win, there was a decent chance tails could come back, but again, I was making a point. We then discussed how this activity mirrored the Electoral College with states like California consistently voting democrat. Finally (and I did not have time to do this election), I was going to weight each row differently. The first row would vote and their winner would receive 4 votes, the winner of the second row would receive 3 votes, the 3rd row two votes and the back row one vote. I was going to have each row announce in order 1-4, then redo this system with the back row announcing first. Please leave a comment if you have any ideas on improving this exercise or need any help implementing it in your class. This entry was posted in Education, Mathematics and tagged activity, call election, declare winner, election, electoral college, high school, math, Mathematics, nate silver, probability, statistics, voting, winner. The following is the abstract of a recent paper I wrote analyzing student performance data. Here is a link to the entire paper. Measurement of student achievement is at the heart of educational policy and standardized testing has been both supported and contested as a genuine representation of student achievement. This study shows that the interpretations of standardized testing may have starkly contrasting meanings for different cohorts of students. By using quantile regression to account for conditional PSAT scores, educational factors such as gender and tracking are shown to effect students in varying ways. For the students in this study, gender was a significant indicator of performance on the PSAT test, with being male accounting for more than a five point “bump.” The conclusion from the quantile regressions is that students with extreme PSAT scores are outliers based on ability or inability, not because of their gender. Meanwhile, students that participated in the “honors” tracking system had more of an increase in their predicted score the higher their conditional PSAT score. This entry was posted in Economics, Education, Papers, Teaching and tagged econometrics, education, gender tracking, honors, PSAT, quantile regression, SAT, statistics, tracking. College Major: A Career Defining Decision?